The notion of “free-form” display was introduced as an intent to move away from rectangular shapes. The first free-form displays were glass-based, non-rectangular flat displays. For example the NEST thermostat features a one of the first circular displays for smart home devices. Those non-rectangular flat displays can be used to enhance car infotainment systems too such as demonstrated by Sharp’s non-rectangular car dashboard display concept in 2015. 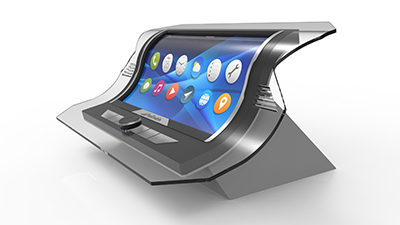 There are also examples of consumer electronics future designs that can be transformed with freeform displays, one example being a controller-like handheld device concept that requires an elliptical touch display that covers the device's entire surface. Non-rectangular glass displays remain rare on the market mainly for the following two reasons. First, the making of those displays incurs extra engineering costs through the design of a bespoke thin-film transistor (TFT) array and the need for new photolithography masks. Those costs can be absorbed for high volume products but remain a challenge today for niche applications. The second reason is the production cost and the challenges posed by using glass substrates. When it comes to complex shapes, the laser cutting process of glass material and the handling of the glass impact negatively on the production yield and increase the costs. Non-rectangular flat displays are certainly a step towards free-form displays but still a step behind the degree of freedom needed by product designers. The ability to wrap displays around objects and structure them to more organic shapes is what free-form really means. Car manufacturers for example want displays that can be seamlessly integrated into the 3D architecture of the vehicle interior. Retailers demand displays that can be conformed to any surface including pillars, curved walls and ceilings. Slightly curved displays are already widely used both in TVs and mobile phones providing products with better viewing angle or simply better ergonomics. They are usually made on glass substrates which limits the radius of curvature to several hundreds of millimetres. The technology for bending the glass requires sophisticated engineering including advanced thermoforming of glass components that must be as thin as they are strong. The curvature is also limited to one axis and one direction of bending due to the mechanical constraints of the glass. Free-form displays should be truly shapeable and the intrinsic properties of glass do not allow it. Plastic displays can reach very tight bend radii and be formed to multiple axes and direction of curvature. The inherent flexibility of the plastic substrate makes plastic displays easy to conform to 3D surfaces. Organic liquid crystal displays (OLCD) are ultra-thin (0.3mm) plastic displays that can be laminated directly onto curved surfaces to a radius of curvature of ten millimetres. Displays should be manufacturable in any shape reliably; and there is no doubt that it is much easier to cut plastic than to cut glass. Today, glass displays are limited to straight or gently curved edges because of the challenges of handling glass with more complex shapes, whereas plastic OLCDs can be easily cut to exotic shapes by laser profiling. Once the display has been built, the plastic substrate can be gently released from the rigid carrier ensuring a simple, reliable high yield “release” process. The ability to cut plastic displays to shape offers an infinite degree of design freedom. For example, it is now even possible to insert a physical hole in the middle of a display to create a “donut shape” display product. Cutting OTFTs to arbitrary shapes is done with a standard CO2 laser trimming tool. The left-hand picture shows the laser cutting tool cutting the non-square outline of the fabricated device shown in the right-hand picture. The cutting process takes place while the plastic device is mounted on the glass carrier for processing. The device is de-mounted using a low-stress heat-based de-mount process. Product designers want to design displays around the product, and not the other way round. “Free-form” means more than non-rectangular; it is the ability to integrate displays seamlessly into any 3D shaped surface. Only plastic displays can become truly free-form displays and wrapped around objects that have multiple axes and direction of curvature. OLCD is the only plastic display technology that enables low cost, large area and shapeable displays today. If you want to unleash your imagination, please contact us at info@flexenable.com.